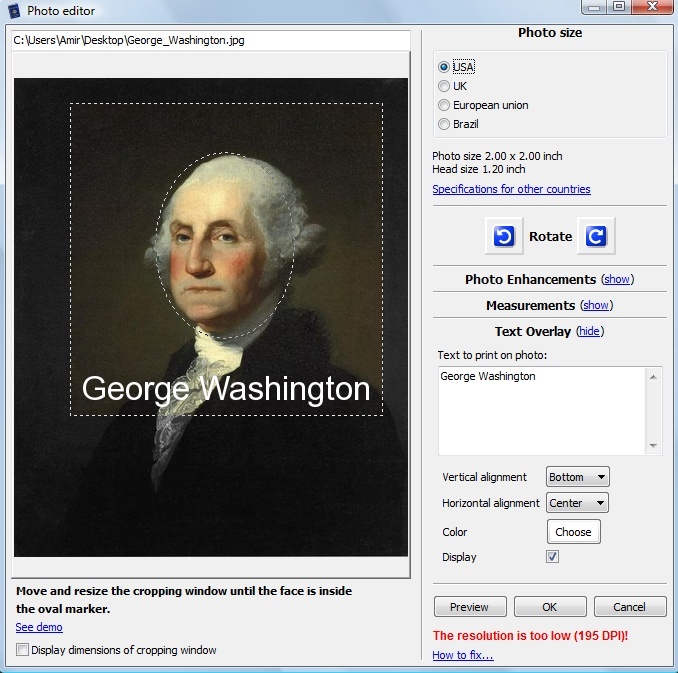 Passport Photo 2.1.0 adds the ability to write text on the photos. Who needs something like this? Identity documents, such as driver license in some countries require that names and IDs be printed on the photo. Passport Photo lets you select the position of the text and its color. Text size is calculated automatically to fit the available space. To use this, just click on the Text Overlay heading in the image editor. This upgrade is free to all registered users. As always, you can get it by downloading the recent version of Passport Photo from our download page. * Of course, the text is only added when printing. The original photo is not modified. This entry was posted on Friday, December 12th, 2008 at 8:25 am	and is filed under Passport Photo. You can follow any responses to this entry through the RSS 2.0 feed. Both comments and pings are currently closed. This is a 3rd times I am asking you a very simple question. Do you know if i can use AVERY Photo Papers No. C2540. (20 per page,self-adhesive photos,size 3.5 X 4.5 cm). I just don’t know. Haven’t used that kind of paper ever. You can just enter your email there and your code will be resent to you. I’m deleting your email from your comment so that SPAM-bots don’t discover it and start sending your unwanted emails. Thank you very much for the update. I have downloaded it but I have lost the activation code. Please send me the activation code and oblige. 610 Harrow Road London W10 4NJ. long time we had contact. Q: can you make the text writing also to be used in the margin of a set of 2-4-6 printed photo’s, because we could then affix the same name as we have filed this set in the different archives or files. Is it possible to show the vert. and hor. dimension of the headoval ring on the sides? This would make it easy to fix a certain dimension for different types of head (child-teen-adult long or round, etc.) in the specifiacation section.